Paul Dusenbury was a multi-talented visual artist, musician, teacher, and proponent of the synthesis of many art expressions. His explorations, infectious inspiration, and originality were well appreciated throughout the Seattle, Washington area where he taught and worked. He expressed caring relationships, and art that combined his unique way with color, light, sound and vivid visual images. Dusenbury was born in Asheville, North Carolina in 1935. His parents, Paul R. Dusenbury, Sr., and Lillie J. Dusenbury, were pioneers in establishing quality education for African Americans there. 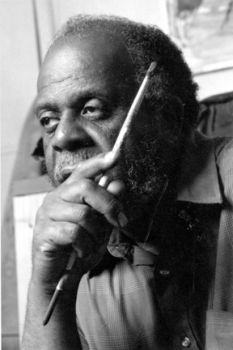 Dusenbury graduated from Hampton University, Hampton, Virginia with a B.A .in Art in 1957, and then served in the U.S. Air Force where he was stationed at Paine Field in Everett, Washington. After discharge in 1964 he was chosen as the Artistic Director for Seattle’s Central Area Motivation Program (CAMP), where he worked with at-risk youth in developing music and art skills. Dusenbury then earned his Masters of Education degree from the University of Washington in Seattle in 1971. He also became an adjunct professor of African American cultural traditions at Seattle Pacific University and later taught in the Theater Department of Principia College, Elsah, Illinois from 1974 to 1976. Returning to Seattle later that year, he taught art at all levels in Seattle Public Schools for over 20 years. Paul Dusenbury developed his impressionistic painting style depicting atmospheric vistas of Puget Sound waters and landscapes. He also created a system of overlapping projected art slides which he called Lightscapes. These often accompanied his avant-garde performances. His career in music took off when he played flute and piano with Seattle area bands. Dusenbury collaborated with Milt Simons in developing the quartet Jasis, to produce the internationally recognized LP album “Jasis: Spontaneous Improvisation,” which is still in circulation. In 1968, Dusenbury pioneered the Central Area School of Performing Arts (CASPA) in Seattle with colleague Milt Simons. They arranged numerous regional performances incorporating dance, poetry, music, theatrical pieces, and visual art. His one-man art shows were held at the Windows Gallery, 360>Fine Art, ArtsWest, AIA Gallery, Security Pacific Gallery, and the Pacific Arts Center. A joint show with the artist Jacob Lawrence was held at ArtsWest Gallery in 2000. Dusenbury was a dedicated Christian Scientist. Paul Dusenbury died in Seattle in August 1998. He was 63.